Students hike in through a private property (special permission needs to be granted in advance) to visit Bermuda's largest remaining mangrove. A quick lesson in Poison Ivy identification is given as we walk under the thick canopy of red and black mangroves. Hungry Bay is home to two uncommon and endangered marine species, the Land Hermit Crab and the Giant Land Crab. The West Indian Top Shells that provide Land Hermit Crabs with their home are seen at this South Shore tideline. 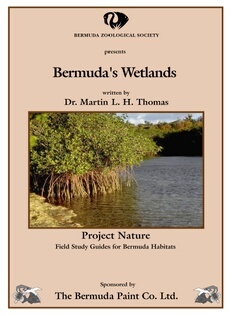 Mangroves, including the importance of fish nurseries.